Can the common weed treat diabetes and liver injury? Although most people think of dandelion (Taraxacum officinale) as a pesky weed, the plant has long been used in herbal medicine to aid in digestion and help stimulate appetite. The entire dandelion plant from root to blossom is edible with a slightly bitter, chicory-like taste. The root itself is sometimes roasted to create caffeine-free dandelion coffee. When used for medicine, the dried or fresh root can be made into teas, tinctures, decoctions (infusions), and poultices. Dandelion root is also available over the counter in capsule form. In traditional Chinese and Native American medicine, dandelion root has long been used to treat stomach and liver conditions. Herbalists today believe that it can aid in the treatment of many ailments, including acne, eczema, high cholesterol, heartburn, gastrointestinal disorders, diabetes, and even cancer. Some of the claims are better supported by research than others. Dandelion is also known as pu gong yi in traditional Chinese medicine and simhadanti in Ayurvedic medicine. Its English folk name "piss-a-bed" and French nickname "pissenlit" both refer to the root's strong diuretic effect. Despite its long-standing use in traditional medicine, there is a lack of scientific evidence supporting the medicinal use of dandelion root. While a number of animal and laboratory studies have been conducted, few have progressed to human trials. Diuretics, also known as "water pills," are commonly used to treat high blood pressure, heart failure, liver disease, and some types of kidney disease. While valuable, the drugs may cause side effects, including muscle cramps, headaches, dizziness, and changes in blood sugar. Some scientists believe that dandelion's diuretic properties may have medical uses, including the treatment of prediabetes or premenstrual bloating and water retention. A 2009 study, overseen by the National Institutes of Health, found that a single dose of dandelion extract increased the frequency of urination—but not the volume—in the 28 volunteers within five hours of a dose. While the researchers were unable to determine how dandelion triggered this effect, the frequency/volume suggests that the extract may function as a bladder irritant. Further research is needed to determine whether ongoing exposure to an extract may cause side effects. 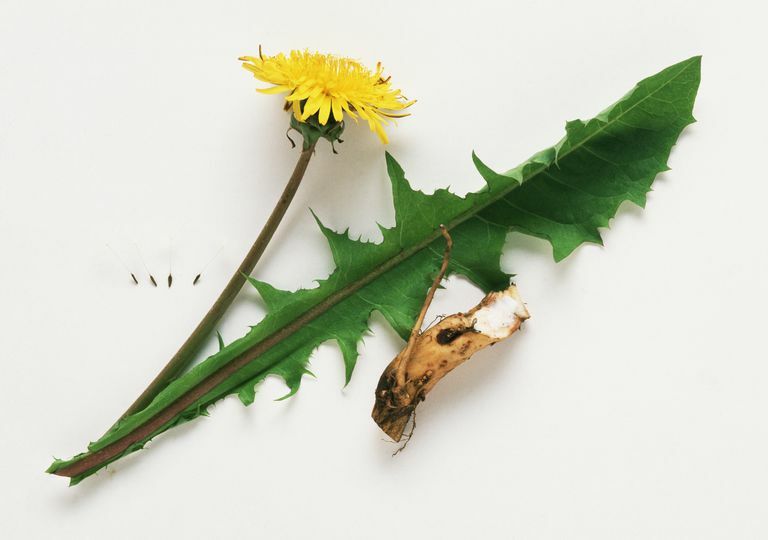 In folk medicine, dried dandelion root is often ground into a paste and mixed with water to create a soothing paste for skin disoders like acne, eczema, psoriasis, rashes, and boils. While there is little evidence that dandelion can treat these conditions better or faster than leaving the skin alone, it does appear to have mild anti-inflammatory and antipruritic (anti-itching) properties. Research also suggests that it may help prevent sun damage. A 2015 study from Canada reported that dandelion extracts are able to block harmful ultraviolet B (UVB) radiation when applied to the skin, protecting it from sun damage while lowering the risk of skin cancer. While this suggests a potential avenue for drug development, dandelion is also known cause contact dermatitis in some people, especially children. As such, you need to take care when applying any dandelion remedy to the skin to avoid an allergic response. Dandelion root is believed to have anti-diabetic properties due to a soluble fiber known as inulin. Inulin contains a complex carbohydrate known as fructooligosaccharide (FOS) which supports the growth of healthy bacteria in the gastrointestinal tract and eliminates the unhealthy ones. This alone increases insulin sensitivity by slowing the flow of sugar from the intestines to the bloodstream, preventing spikes in either your blood sugar or insulin levels. A 2016 review of studies from Aarhus University in Denmark suggested that dandelion extract also stimulates pancreatic cells to produce insulin, better controlling blood sugar and avoiding hyperglycemia. Dandelion is often consumed as a tonic under the presumption that it "cleanses" the liver. There is some evidence, albeit sparse, to support this long-standing claim. A 2010 study published in the Journal of Ethnopharmacology reported that mice fed a dandelion root extract experienced a significant slowing in the progression of liver scarring (fibrosis) compared to mice given a placebo. According to the research, the extract was able to inactivate the primary cells involved in fibrosis, called hepatic stellate cells. Doing so all but lifted the oxidative stress on the liver, allowing the liver to heal and slowly regenerate. Preliminary research suggests that dandelion root may have promise as an anti-cancer agent. it does so by inducing apoptosis, also known as programmed cell death, in certain cancer cells. Apoptosis affects all of the cells of the body, allowing old cells to be replaced with new ones. With cancer, apoptosis ceases, allowing the tumor cells to grow unimpeded. A 2012 study from the University of Windsor in Canada reported that dandelion root extract was able to induce apoptosis in pancreatic and prostate cancer cells in test tube studies, either slowing their growth or preventing their spread. No other cancer cell types were affected in this study. Several later studies have shown that different dandelion root extracts were able to trigger apoptosis in leukemia and melanoma. While the studies are promising, further research is needed before dandelion root can be recommended for either the prevention or treatment of cancer. Dandelion root is generally considered safe and well tolerated in adults if consumed in moderation. Some people may experience side effects, including heartburn, diarrhea, upset stomach, and irritated skin. If you are allergic to ragweed, chrysanthemums, marigold, chamomile, feverfew, yarrow, or plants in the Asteraceae family (such as sunflowers and daisies), you should avoid dandelion root as it may trigger rash, watery eyes, and other allergy symptoms. Dandelion also contains iodine and latex, so avoid it if you have allergies to either of these substances. In some cases, a dose adjustment may be needed. Other drugs may also be affected, so never hesitate to tell your doctor about any herbal, naturopathic, homeopathic, or traditional medicine you may be taking. There are no guidelines for the appropriate use of dandelion root in the United States. However, in Europe, both the European Commission and the British Herbal Pharmacopoeia recommended the following range of doses considered safe for adults. Dandelion root supplements are also available in drugstores and vitamin supplement stores, along with tinctures, teas, extracts, ointments, powders, and dried organic root. As a rule of thumb, never exceed the dosage recommended by the manufacturer. If you experience side effects of any sort, stop treatment and call your doctor. Dandelion root remedies are classified as dietary supplements by the U.S. Food and Drug Administration (FDA) and do not need to undergo the stringent testing that pharmaceutical drugs do. Because of this, the quality of the products can vary. To ensure the highest quality and safety standards, purchase supplements that have been independently tested and certified by a recognized authority like the U.S. Pharmacopeia (USP), Consumer Lab, or NSF International. For added safety, choose dandelion products that have been certified organic to avoid exposure to pesticides and chemical fertilizers. Dandelion readily absorbs pesticides, heavy metals (such as lead, nickel, copper, and cadmium), and other substances from the environment, so it is generally not a good idea to eat wild dandelion if the purity of the soil, water, and air are unknown. When buying a supplement, don't be swayed by claims that it can cure or treat any specific disease. Under the FDA labeling laws, it is illegal to do so. Claims of these sorts are rarely supported by clinical evidence. When is the best time to harvest dandelion root? Dandelion root is traditionally harvested in the fall when concentrations of inulin are at their highest. Because the root absorbs chemicals in soil, avoiding harvesting roots alongside roads, driveways, septic tanks, pools, air conditioning units, or barbecue grills. If you don't plan to use the harvested roots immediately, you can dry them in a dehydrator and store them in a glass jar for up to a year. If dried correctly, the outer flesh should have a dark color while the inner flesh should remain a creamy white. Clare, B.; Conroy, R.; and Spelman, K. The Diuretic Effect in Human Subjects of an Extract of Taraxacum officinale Folium over a Single Day. J Altern Complement Med. 2009;5(8):929-34. DOI: 10.1089/acm.2008.0152. Domitrović, R.; Jakovac, H.; Romić, Z. et al. Antifibrotic Activity of Taraxacum Officinale Root in Carbon Tetrachloride-induced Liver Damage in Mice. J Ethnopharmacol. 2010 Aug 9;130(3):569-77. DOI: 10.1016/j.jep.2010.05.046. Ovadje, P.; Chochkeh, M.; Akbari-Asl, P. et al. Selective Induction of Apoptosis and Autophagy Through Treatment With Dandelion Root Extract in Human Pancreatic Cancer Cells. Pancreas. 2012 Oct;41(7):1039-47. DOI: 10.1097/MPA.0b013e31824b22a2. Wirngo, F.; Lambert, M.; and Jeppesen, P. The Physiological Effects of Dandelion (Taraxacum Officinale) in Type 2 Diabetes. Rev Diabet Stud. 2016 Summer-Fall; 13(2-3): 113-31. DOI: 10.1900/RDS.2016.13.113. Yang, Y. and Li, S. Dandelion Extracts Protect Human Skin Fibroblasts from UVB Damage and Cellular Senescence. Oxid Med Cell Longev. 2015; 2015: 619560. DOI: 10.1155/2015/619560. You, Y.; Yoo, S.; Yoon, H. et al. In Vitro and In Vivo Hepatoprotective Effects of the Aqueous Extract From Taraxacum Officinale (Dandelion) Root Against Alcohol-Induced Oxidative Stress. Food Chem Toxicol. 2010 Jun;48(6):1632-7. DOI: http://dx.doi.org/10.1016/j.fct.2010.03.037.